journal, Federal Poet, edited by Pam Blehert. 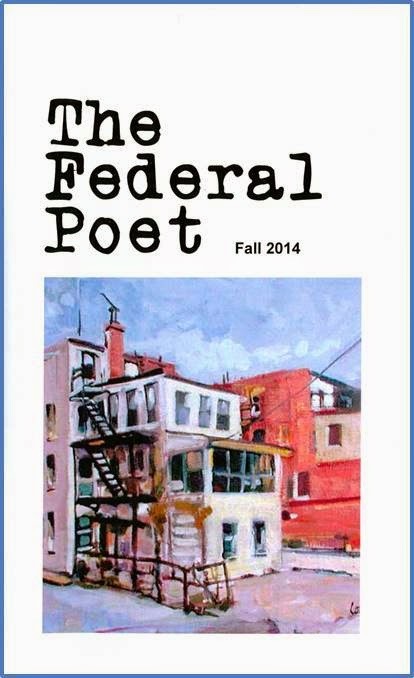 Federal Poets has its own website and Facebook Page. I have been a member since 1985, vice president since about 2005. I remember how much the Federal Poets’ welcome meant when I came to the area, uprooted from my long-term Michigan writers’ workshop and college teaching. I’ve stayed with Federal Poets to give back, to enjoy long-term and newer poet friends—and because the critiques and audience I get are good for my poems. Craig Reynolds, a black gay activist poet, superb m.c. and organizer, was our president and editor till 1988; Craig arranged for us to read at Ford Theatre and Old Post Office Pavilion—the latter with Rod Jellema and Myra Sklarew as honorary guests (tribute Federal Poet Spring 1995). Frank Goodwyn, a novelist, memoirist, retired U. MD Spanish professor—and a cowboy poet—became president in 1989; followed by Nancy Allinson in 1992 as president, editor, and readings organizer; followed by Don Illich as president and readings organizer since September 2012. About one-third of our diverse members are involved in other poetry venues: as GWU’s Jenny McKean Moore Scholars; Word Works DC editors and volunteers; Writer’s Center workshop leaders and participants (Miles David Moore and I have Words Works books, and have taught for the Center), etc. At least five workshops and two reading series come out of Federal Poets. Bob Haynes founded a workshop and Lip Service little magazine c. 1986. Ingeborg Carsten-Miller, a bilingual German poet, founded the Fairland Library Literary Salon in 2001. Jean Lehman had an Alexandria workshop and readings. Ninie Syrakin’s D.C. House of Poetry may predate her Federal Poet membership. Ann Rayburn and Pamela Passerata created new, smaller workshops. Miles David Moore hosts Arlington’s Iota Poetry Series 1994-; I arrange the Kensington Row Bookshop Poetry Series 2003-. The Washington Post November 14, 2008 Weekend “Prime Time” featured Federal Poets, as did their January 15, 2012 Sunday Magazine cover story.